1. Click on the File -> Save configuration file menu item to save the configuration settings to a disk file. File name must be �DASH.HEX� (All capital letters including the file extension). If the DASH4PRO is connected to a DL1 MK3 then the .cmg file format can be used. This enables the DASH4PRO to be reprogrammed when connected in a system with multiple items without having to be disconnected and connected directly to the Data Logger. 2. Copy the file to the root directory of an empty, formatted, compact flash card. 3. Turn on the display and the logger. 4. Insert the compact flash card with the "DASH.HEX" file in to the Data Logger. 5. Once the card is inserted then the information will be automatically read and transferred and the display configured. While transferring DASH4PRO’s backlight will be turned off and gives a message Programming…. When configuration is successful the device will display the message Configuration Success on screen. When process is completed, backlight will be turned on again and it comes to normal display mode. Note that the display will remember its configuration - there is no need to repeat the operation every time the display is used. This is only necessary when making changes to the configuration settings. Note: You will require a special connector to connect the DASH4PRO to the PC (not shipped with the DASH4PRO). For more information please contact Race Technology. Connect the DASH4PRO unit to a COM port on your computer. Ensure that you switch off the device whilst connecting. Connection is made using the adapter supplied by Race Technology on request (if you haven�t got the adapter, please contact Race Technology sales). 2. When you are ready, click on the File ->Configure the DASH4PRO menu item or toolbar button with the similar functionality. 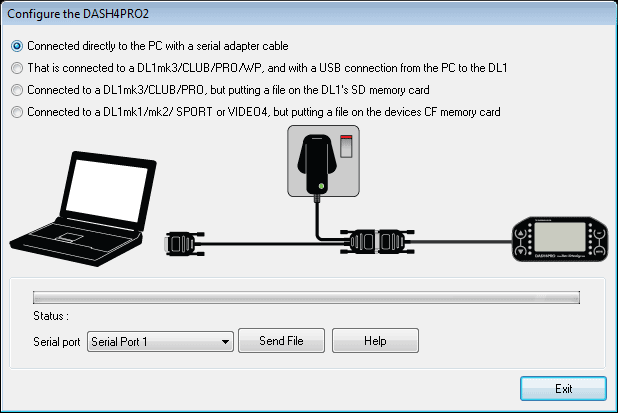 The �Configure the DASH4PRO� dialogue box will be opened. 3. Select the correct serial port number and press the "Send File" button. When configuration is successful the device will display the message �Configuration Success� on screen. When it finishes, the backlight will be turned on again, and device comes to its normal display mode.